A mother’s employment status can be affected by her family structure. 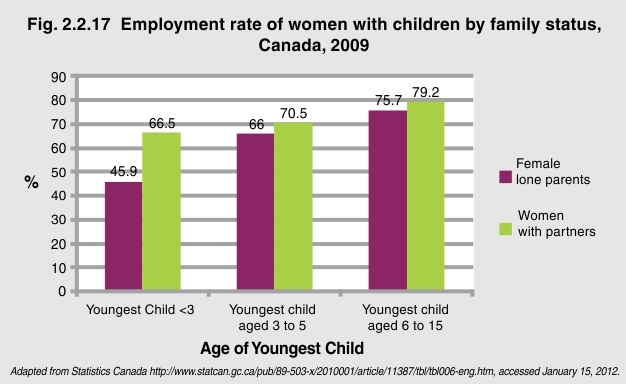 Women with younger children are less likely to be employed than are those with older children. Still, in 2009, 45.9% of lone-parent mothers and 66.5% of women with partners who had a child under 3 years were employed outside the home. By the time children are in school, 75.7% of lone-parent mothers and 79.2% of mothers with partners are employed. With an increasing number of mothers working outside the home, it is important to provide more accessible and affordable early childhood care and education, and after school care.